Students streamed out of their classrooms chanting in unison in the mountainous Utuado region of Puerto Rico earlier this month. They took over the halls and doorways of Luis Muñoz Rivera High School on Thursday, Sept. 10, locking their arms together to create a human chain. They paralyzed their school, shut it down, and allowed no one in or out. The reason? Not too much homework. Not lack of choice in the cafeteria. Not an unfair dress code. These roughly 100 teenagers were protesting the loss of their teachers. And they vowed to occupy their own school until the government gave them back. Six educators had been ordered to other schools, which would have ballooned classes at the Rivera School to 35-40 students per classroom. Government officials claimed the high school had too few students to justify the cost. However, with more than 500 young people enrolled, the school has more than double the island average. The students including Vélez, 17, called an assembly to discuss the situation where they voted unanimously to take action. They blocked two gates and wrote a document demanding the Puerto Rican Department of Education revoke the decision to remove their teachers. 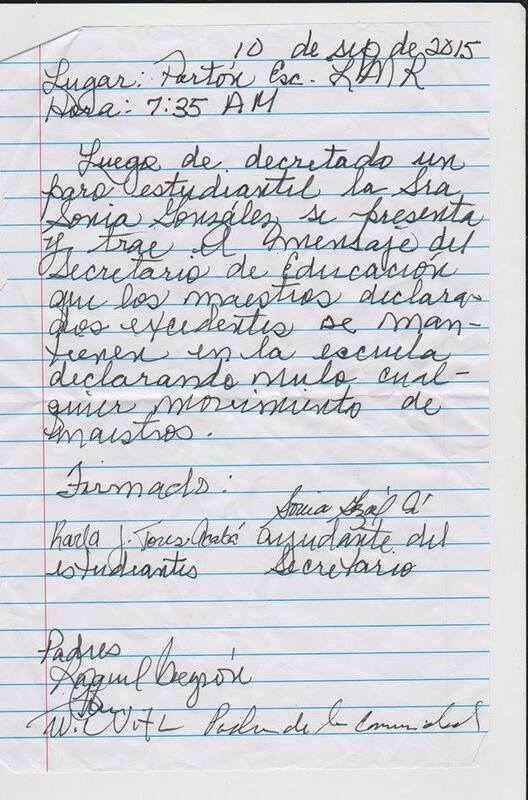 Later that day, Sonia González, a representative of the Secretary of Education, met with students and signed the document promising to keep the teachers at the Rivera School. Three parents and one student also signed. The affected teachers are Alex Natal, a 10th grade physical education instructor; Naixa Maldonado, an 11th grade Math educator; José Cruz, a 10th and 11th grade History teacher; María Medina, a 12th grade Physics instructor; Damaris Figueroa, an 11th grade Spanish educator; and an 11th grade English teacher. Vélez said she’s surprised the government agreed to students’ demands. “ I was willing to keep the strike all the time necessary to solve our problem and get our teachers back,” she said. What happened in the Rivera School is not an isolated incident. All across the island, communities are fighting government mandates to relocate teachers, increase class size and shutter more schools. This Tuesday at Pablo Casals School, an arts institution in Bayamon along the north coast, students protested the government decision to relocate their theater teacher, Heyda Salaman. 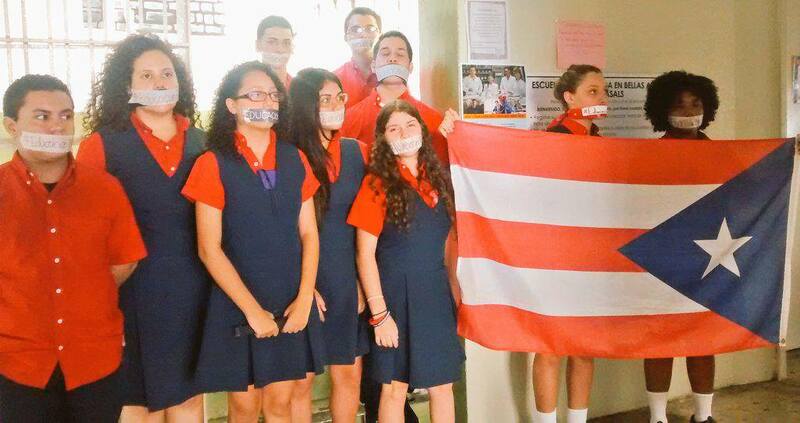 About 100 students hung the Puerto Rican flag upside down and taped their mouths shut to represent the state of the government and the silence officials expect from the community. Just like in the case of the Rivera School, the government eventually relented and agreed to keep the teacher with her students. The teachers union – the Federación de Maestros de Puerto Rico (FMPR) – has supported student protesters throughout the island. “The Teachers Federation from Puerto Rico is proud of the actions these students performed,” said union president Mercedes Martinez about student actions at both facilities. “We have a good education and excellent teachers but the administration is failing their workers,” she said. The Commonwealth government has closed 150 schools in the past 5 years in the U.S. Territory. The island is besieged by vulture capitalists encouraging damaging rewrites to the tax code while buying and selling Puerto Rican debt. The indigenous population has suffered at the hands of western conquerors since Columbus, but the newest fruit of Colonialism may be these corporate education reform policies. Young people like Vélez aren’t revolutionaries. They look just like any ordinary teenage boys and girls wearing t-shirts and blue jeans, baseball caps turned backwards, backpacks slung across their shoulders. But they have had enough. They aren’t going to accept the low expectations of the corporate world about what constitutes a fair education. 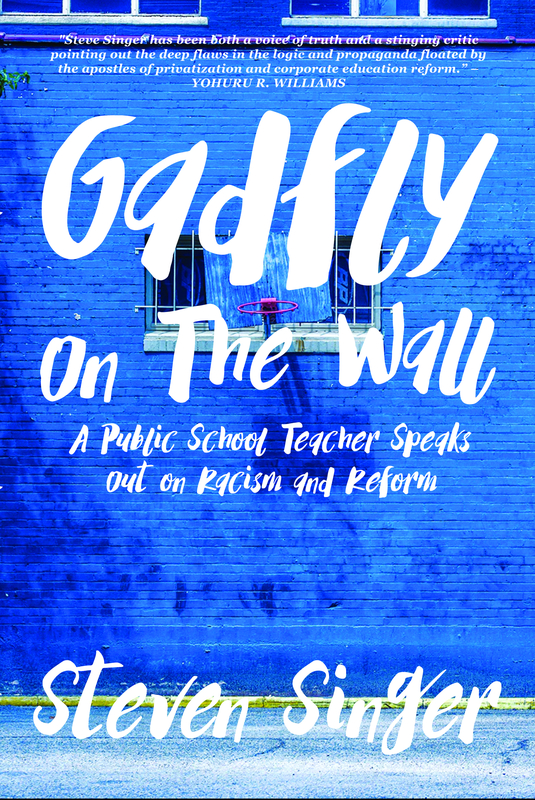 NOTE: This article also was quoted extensively on Diane Ravitch’s blog and published in full on the Badass Teachers Association blog. What these students are doing is so inspiring. It is nice to see how much these teenagers care about and value their education and teachers. I found their well thought out display of protest very intriguing and insightful from my expectation of High Schoolers. I am so glad that the government is responding to the students and giving them what they deserve to the best of their ability. Hopefully other wronged students will hear of the protests and fight for their right to education just as hard. After all, even the Teachers Federation from Puerto Rico is proud of and supportive of these students. I hope that this can lead to bigger changes in a failing system before the impact is much more detrimental on the children of Puerto Rico. Excellent demonstration of the rights and power students and parents have demanding schools provide a quality education for all students so that they become productive citizens and give back to their communities.